cookies – What's Cookin' @ Special Collections?! 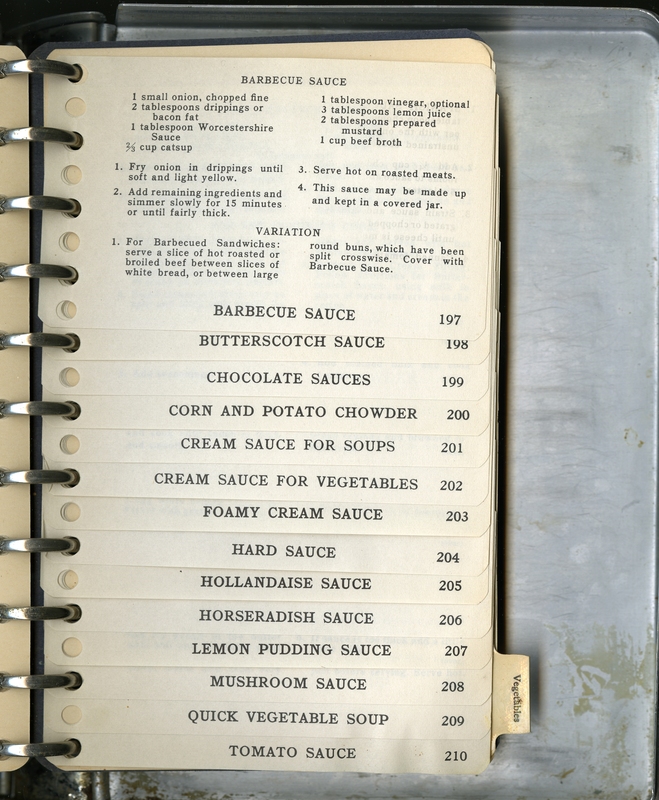 This version comes from a handwritten recipe book in our collection, one that we believe dates from the 1930s. 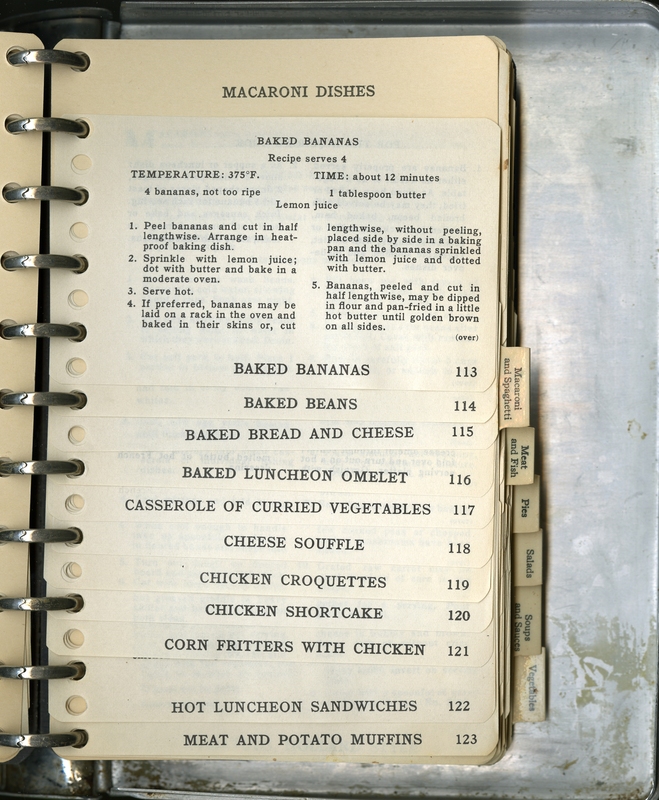 You can read more about the recipe book in the finding aid and you can see the whole item in digital form. Or, you can just make some tea biscuits and enjoy them for what they are! That being said, I can’t think of a better way to celebrate than with some festive, monochromatic (and occasionally polychromatic) party recipes…and the return of the frosted sandwich (It’s been a while, I know)! An art deco rose party in progress? For the curious, layers include: minced ham, egg yolks mashed with margarine, chopped sweet pickles with parsley and mayonnaise. There’s also a suggested “orange layer” made with chopped pimentoes and green pepper mashed with cream cheese and mayo. As you can see, brown and orange parties have a wide variety of uses, from football games to picnics. The American Beauty Cake, named for the rose (they REALLY got into the pink/rose theme) is flavored with coconut and almond. Today’s images are from Good Luck Color Scheme Parties. 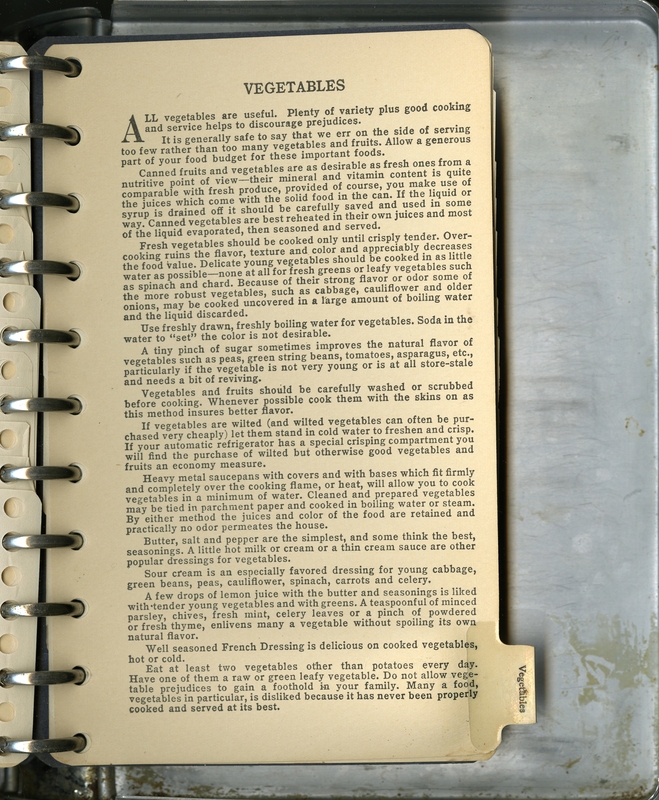 Published in 1931, this 32 page pamphlet features creative recipes in a range of colors and flavors. It covers not only holidays, but also card and occasional parties, all while, of course, promoting John F. Jelke Company products like Good Luck Margarine and Evaporated Milk. This plain cake is separated by layers of tasty jam. Sad marshmallow clown aside, we needed a (belated) birthday cake image to celebrate the blog. So, here’s looking forward to another year of posts and LOTS more learning about the History of Food and Drink Collection! It may just be your year to pay us a visit, too! It’s that time of year where some people have ginger on the brain. The Internet is full of gingerbread creations: loaves, cookies, men, houses, villages, monuments, and pop-culture icons. (You can see the results of an image search on “gingerbread creations” here–nothing rude, I promise.) Not surprisingly, the History of Food & Drink Collection is full of recipes. Nothing quite as exciting as the Arc de Triompe or a whole village, but the variations are many. Martha Washington’s Booke of Cookery; and Booke of Sweetmeats, 1995. This volume includes recipes from a manuscript cookbook owned by Martha Washington from 1757 to 1799. From The Robert E. Lee Family Cooking & Housekeeping Book, 1997. Loaf Gingerbread from Nannie G. Figgat’s recipe book, c. 1860s. One of two recipes for ginger cakes in Nannie G. Figgat’s handwritten recipe book, c.1860s. Of course, like many recipes up through the late 19th century and into the early 20th century, if you’re looking for specific baking directions, you may be out of luck. If you feel like trying one of the recipes from our post today, you may have to draw on the more modern recipes for oven times and temps–but let us know! We’d love to hear about your experience. from us to you. 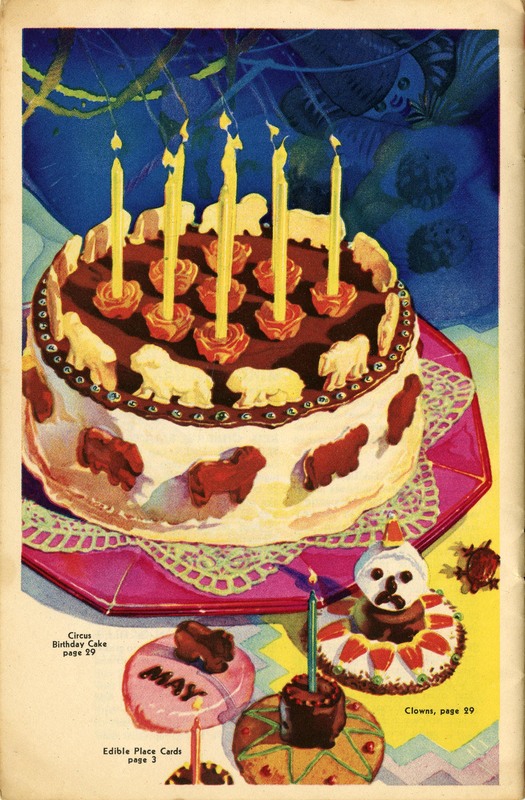 We’ll be back in 2013 with lots more books, manuscripts, recipes, and images (edible and not-quite-so), and more news, events, and new acquisitions! Peter Pauper Press. ABC of Cookies. Mount Vernon, N.Y.: Peter Pauper Press, 1961. Pillsbury Company. “Do-It-Together” Butter Cookies: 56 Fabulous Cookie Ideas Plus 41 Do-It-Together Decorating Ideas. [Mpls. [Minneapolis], Minn: Pillsbury Flour Box, 1965. The Cookie Book. San Francisco, CA: Fog City Press, 2001. This week’s post features recipes from three different recipe books. 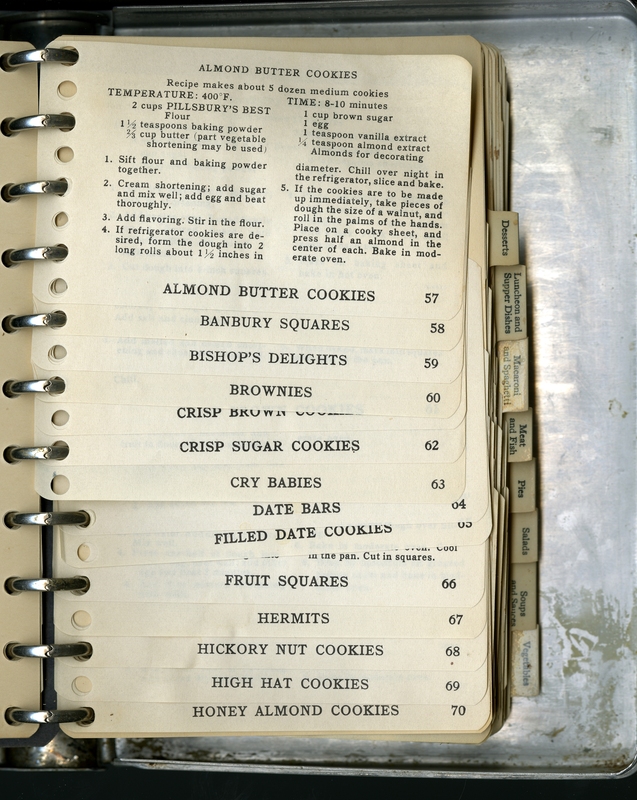 The ABC of Cookies from 1961 includes selected recipes beginning with each letter of the alphabet, except for that “XYZ” combination at the end (“X-Tra Special Walnut Cookies”). Each section starts four lines of poetry, and has at least one recipe for cakes/tea cakes, bars, drop cookies, rolled cookies, pastry cookies and specialties, and winter classics like spice and fruit cookies. “Do-It-Yourself” Butter Cookies: 56 Fabulous Cookie Ideas Plus 41 Do-It-Together Decorating Ideas (1965) is a pamphlet sponsored by a number of companies, as the cover clearly shows. It contains recipes for cookies, but also some creative display and serving alternatives (cone-shaped pine trees with hooks and snowmen with dowels in their arms for holding cookies, both using a modeling mixture make with flour). There are also a few great advertisements, including one for Nestle’s “Choco-bake,” a liquid chocolate baking additive. The final book of this week’s cookie trilogy is a bit more modern: The Cookie Book from 2001, which touts itself as “the only cookie book you will ever need.” Whether that’s true or not, this book does have a wide selection of recipes! Venturing into the “savory” section might require a little kitchen boldness, but whatever you like, there are options: chocolate, fruit, spices, nuts, coffee, or butter. 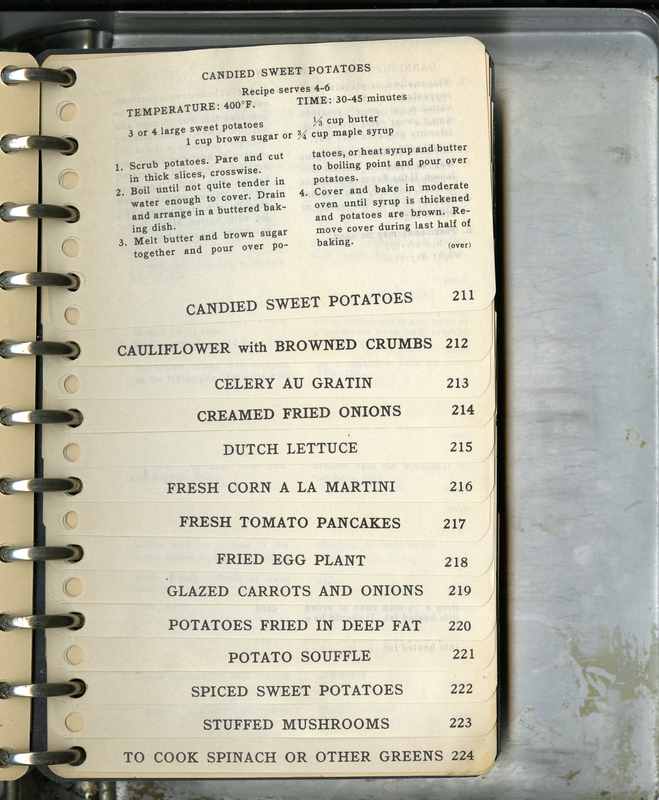 Sometimes, a cookbook just looks different, which seems more than enough reason to share. 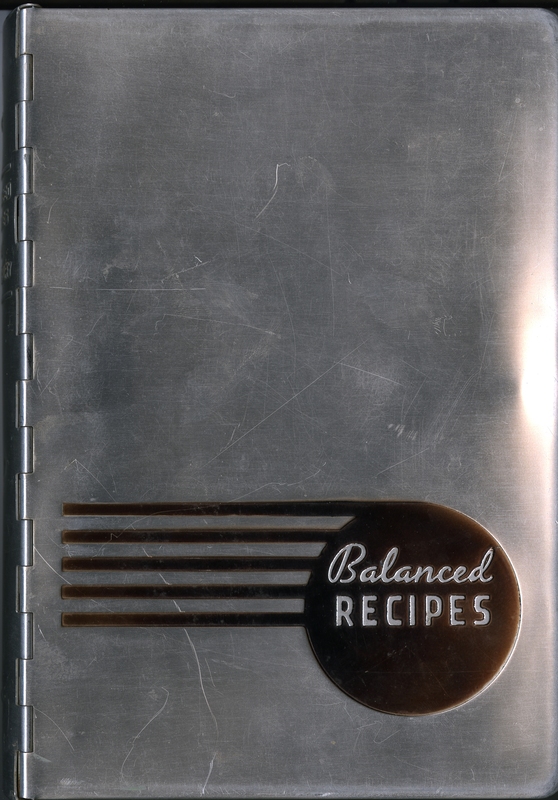 Balanced Recipes is a perfect example. 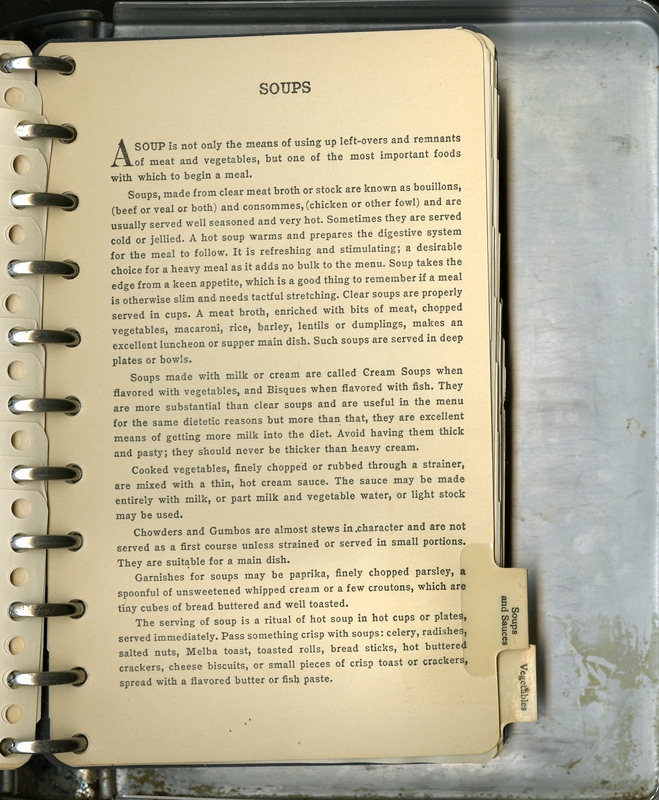 The recipes themselves are on index card sized slips of paper, hole punched, and layered throughout the book by subject, allowing you to easily see and access them. Even more striking is the “binding.” It is hard to miss this shiny, metal-encased wonder on the shelf while browsing. [I]t it certainly poor menu psychology to plan an entire meal from left-overs. No matter how delicious each separate dish may be, avoid serving a meal consisting of hash, mixed fruit or vegetable salad and a dessert which has appeared in exactly the same form at a previous meal. 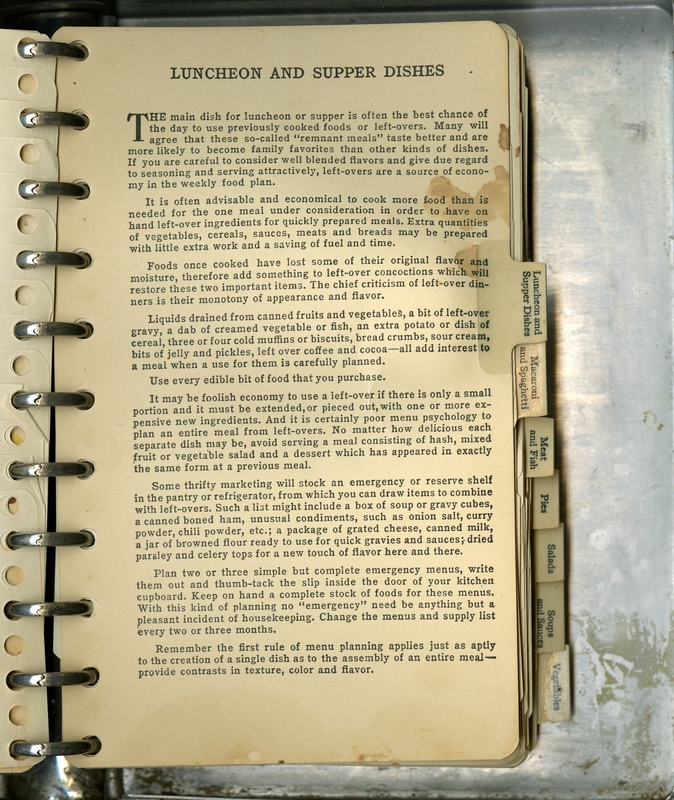 Balanced Recipes was the product of Mary Ellis Ames, who wrote at least three other publications for the Pillsbury Flour Mills Company in the 1930s and 1940s: Pillsbury’s Cookery Club (1934), Your Guide to Better Baking (1941), and The Three “R”s of Wartime Baking: Rations, ‘Richment and Recipes (1943).